Wake Car - This control tells Tesla Control whether you want it to wake the vehicle if it is sleeping. This options is ON by default. Metric Units - This control tells Tesla Control whether you want it to display Metric or English units. This options is ON by default for countries that use the Metric system. Ideal Range - This control tells Tesla Control whether you want it to display range values using Ideal or Rated range. This options is OFF by default. Show mi/KWh - This control tells Tesla Control whether you want it to display energy values as Wh/mi or mi/KWh. This options is OFF by default. #.###,## Format - This control tells Tesla Control whether you want it to display numeric values using commas or decimals as thousands separators. This options is ON by default based on region. Live Tile - This control tells Tesla Control whether you want it to enable Live Tile updates. Note that Live Tile updates require the use of background tasks which consume power and data. This options is ON by default. Use Celsius - This control tells Tesla Control whether you want it to display temperature values using Celsius or Fahrenheit. This options is ON by default for countries that use the Metric system. - Clicking this control allows you to Rate and Review Tesla Control in the Windows Store. - Clicking this control allows you to provide Feedback on Tesla Control in the Windows Store. 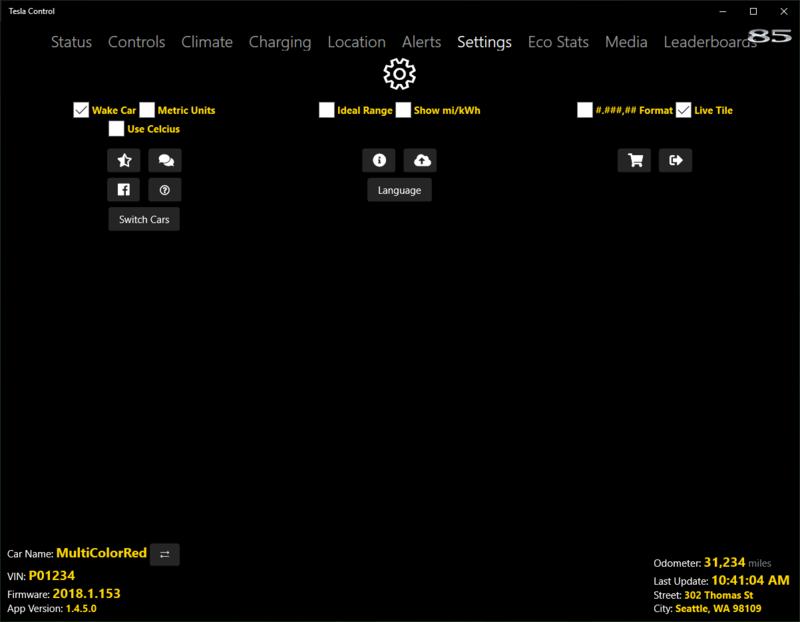 - Clicking this control displays detailed information on the currently selected vehicle's configuration. - Clicking this control generates a diagnostic report email ready to send to Tesla Control support. If you report an issue with the app you may be asked to send one of these reports. - Clicking this control displays the add-on upgrades available for purchase from the Windows Store. - Clicking this control logs the current user out of Tesla Control. Note: This deletes the OAuth access token from the local device. - Clicking this control opens the Tesla Control Facebook page. Users are encouraged to follow Tesla Control on Facebook to learn about, request and discuss new features, and report bugs. - Clicking this control opens the Tesla Control frequently asked questions (FAQ) web page. Users are encouraged to explore all of the documentation on the Tesla Control website to learn about the full range of features available. Language - Clicking this control (if available) allows the user to switch the default display language. Note: This option is only visible if you have more than one language pack installed on your Windows device. You can install more languages by going to Windows Settings and selecting Region and Language. Switch Cars - Clicking this control (if available) switches between the vehicles associated with the current Tesla.com user account. Note: The control will only be visible if there are more than one car associated with the Tesla.com user account. - Clicking this control (if available) initiates a General Data Protection Regulation (GDPR) User Data Request. A confirmed email address is required in order to send your data. This option is only available to users in the European Economic Area (EEA). Processing user data requests has a cost and so there are limitations on how frequently you may request your data. - Clicking this control (if available) initiates a GDPR Account Deletion Request. After user confirmation, all account data will be marked for deletion. This option is only available to users in the European Economic Area (EEA). Note: Once account deletion has been requested, you must immediately terminate Tesla Control to avoid generating new data. If you run Tesla Control again it will result in new data being collected.